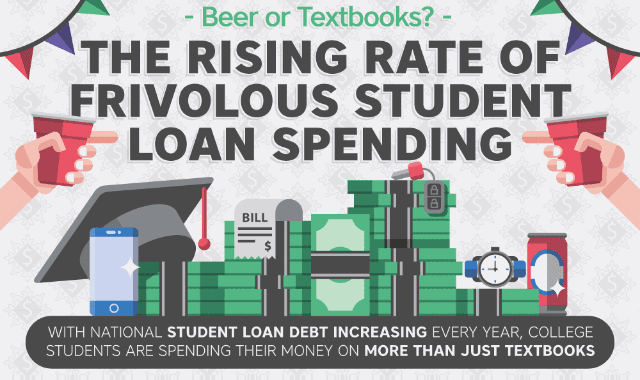 How Students Are Spending Loan Money #Infographic ~ Visualistan '+g+"
When you’re 18 and just leaving home to attend University for the first time, you aren’t necessarily thinking about your future after school. Unfortunately this is also the time many students in the United States begin taking on massive debt loads that can never be bankrupted, leading them into a life where they will never be able to afford both to pay back their loans and also start their life as a recent college graduate. There has even been a sharp decline in home ownership, entrepreneurship, and even getting married because of the massive levels of student loan debt that most people are graduating with these days. The best way to prevent this from happening to you is to minimize the amount of debt you take on in the first place. Only finance what is absolutely necessary, and find ways to pay for as many of your expenses as you can along the way. Learn more about student loan debt from this infographic!